Men can be so difficult to buy gifts for. I know it might be a stereotypical statement but from my experience at least they tend to already have everything they need. When it comes to items they are lacking in, however, beauty products always seem to come out on top (narrowly followed by matching socks of course) and with Father’s Day as our next upcoming holiday - June 19th, don’t panic! 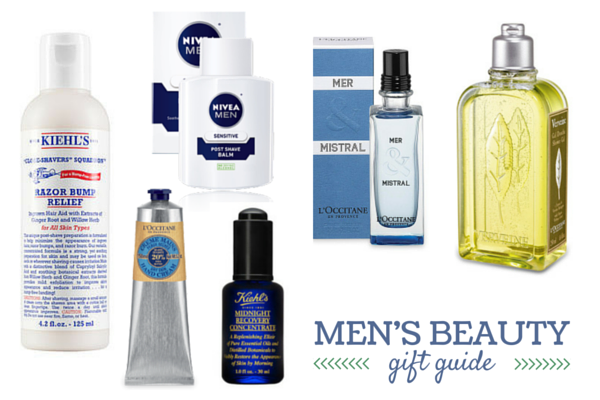 - I’ve decided to compile a Men’s Beauty Gift Guide in collaboration with L’Occitane for the occasion which is also for birthdays, anniversaries or any other form of celebration you might have coming up in your life. The hype surrounding Nivea’s Post Shave Balm has also inspired this post and even though products may be categorised as ‘For Men’ or ‘For Women’ the magical shave balm is living proof that we shouldn’t just shop within these binary divisions. The scents and products that I’ve featured in my Gift Guide are definitely universal and it also means that if you discover that the recipient of the present, whether it’s a father, partner, brother etc, doesn’t end up sticking to their new beauty regime then you definitely have an excuse to adopt the product as your own and use it yourself. It’s a win-win situation if you ask me! My first 3 picks are from L’Occitane, a brand who I personally adore and who have a wonderful selection of products and fragrances suitable for men. My first recommendation is their Mer & Mistral Eau de Toilette, an uplifting and refreshing scent inspired by the breeze of Grasse, a town on the French Riviera. The fragrance is a lovely combination of lemon, mandarin, cypress, pine and rosemary and it is perfect for Spring and Summer - I even have a little bottle of the shower gel myself! Next is a L'Occitane Classic: the Shea Butter Hand Cream. It has a super rich and creamy formula and it has a very light, comforting scent that isn't overly feminine. My final L'Occitane pick for my gift guide is from the Verbena range, a zesty lemon fragrance that is loved equally by men and women. The Vervaine Shower Gel is the perfect pick me up for early mornings and like all the L'Occitane shower gels its scent lingers for hours and I find it to be soothing and slightly moisturising too! The entire line is amazing but I have a feeling the shower gel will be most popular with men. Kiehl's also make some incredible skincare products and I couldn't create this Gift Guide without including them. Their Midnight Recovery Concentrate is a staple in my own skincare routine but I also think it would be a wonderful gift for any man. It really transforms the skin over time, replenishing moisture whilst adding radiance to the face. The lavender essential oils really help you sleep and the pipette applicator is rather cool too. Another amazing product for men is Kiehl's Razor Bump Relief. I've actually had my eye on this product for a while but for the man with sensitive skin who shaves frequently I can't think of anything more perfect — irritated skin and ingrown hairs on the face have to be the awful! In a similar and slightly cheaper form, of course I had to include the famous Nivea Post Shave Balm. Even if you buy this for a man just so you can steal it back ten minutes later I still thought it was worth mentioning! It's the thought that counts, right? Do any of you have any favourite products that work well for both men and woman? Let me know what beauty items you would buy for a man in the comments below! *This post was written in collaboration with L'Occitane.